While the Stern Review is widely cited as evidence of the costs of global warming, it was completed before any of these facts were known. Wouldn’t it be ironic if the unknown unknowns actually mean there is a net benefit to CO2 emissions? And if there is, and it is reasonable to charge emitters for the “bad” effects of atmospheric CO2 via carbon levies etc, then isn’t it just as reasonable to charge renewables for the externalities of not having CO2 in the atmosphere? Here are some pieces of evidence on what is actually occurring in the world. First, a graph looking at droughts in the continental USA. McCabe, G.J., Wolock, D.M. and Austin, S.H. 2017. Variability of runoff-based drought conditions in the conterminous United States. International Journal of Climatology 37: 1014-1021. The second half of the C20 is obviously much wetter than the first half, and it wasn’t until the 40s that CO2 was reckoned to have much of an effect. This is echoed by data from our own BOM. A small team of researchers with the Directorate for Sustainable Resources in Italy and Ghent University in Belgium has found evidence that shows some parts of the planet are becoming cooler and others warmer due to an increase in localized greening. As the team notes in their paper published in the journal Science, much of the increase in greening is due to an increase of atmospheric carbon dioxide. And to round it off, here is a graph on tropical cyclones, again from the BOM. It seems like mankind’s greatest experiment in coincidental geo-engineering may actually be paying unexpected dividends, assuming of course that in these cases correlation equals causation. Benefits Graham? Are you serious? I don’t see any benefit in increased rainfall that includes 1 in 100 year flood events or wilder weather? Increased global convection has to result in increased wind speed just for starters? And unseasonal wild weather the like of which, blacked out an entire state! Increased Co2, may well result in more luxuriant plant growth, the greenhouse effect. That as a typical side effect, aspirates more atmospheric moisture, that typically traps more heat. As evidenced by overcast winter nights being traditionally frost free, whereas, a dry atmosphere even as far north as the Atherton tablelands can result in frost? Nor can there be any benefit in longer more enduring droughts and accompanying desertification? And as the Sahara demonstrates, which was once the granary of rome! Once desert sands claim the land they rarely relinquish it? Nor can there be a benefit from rising sea levels that time after time claim real estate, oft times with houses perched on them? During the height of our last drought 4 farmers a day were suiciding! And as that occurred, none saw a benefit, not the grieving widow, kids nor bank manager! Just the usual parasites who attended the fire sales as various properties were wound up? During that last drought, the waters of Wivenhoe, sunk so low as to make the much touted Slipyard dam inoperable, and much lower water levels in Tasmania and New Zealand, compromised a largely hydro dependant system! Our blinkered vision, with more of this in prospect, only more so? Is to throw three billion or so at pumping it uphill? While the obvious solutions go begging due to prima donna politics alone? We pay 24 cents a kilowatt hour for power now? What will it rise to if we are forced to pump desalinated cooling water, just to keep the lights on? And as every boy and his dog now knows, when the normal cooling water returned, the normal prices did not! To the point, where farmers are forced to contemplate returning to cheaper diesel to irrigate food and fibre crops? Gas would be a better option if we still had some to bless ourselves with? Nobody benefits from climate change not even a warmer Alaska or Siberia, where the melting tundra has created dozens of new melt lakes and consequent increased (lighter than air)methane emission as millions of annual tons? During our last summer, with record heat waves, folks out west were forced to run air conditions day and night due to granny killing temperatures, with some reporting record power bills, that all but destroyed regional, discretionary spending dependant, economies? Albeit, there might have been a spike in the power company’s profit curve? So they might benefit, at least until the economy goes under? Given former discretionary sending goes to recurrence? This is frog in the bowl stuff, made warm and comfortable until cooked, at which time it tries to hop out! And as always in this endlessly repeatable experiment, always seconds late, when seconds count! Something like 97% of bonafide climate scientists agree that climate change is real and that we are causing some of it! The dissent seems to be coming from other disciplines or climate agnostics? Regardless of credible evidence to the contrary? Ultimately nobody benefits, not bankers, dispossessed homeowners nor the millions displaced by enduring drought! We could wait and see, until someone else shows the way, or when we are forced to act by rising waters and the disappearance of 70% of our economy, [which is generated in our coastal communities,] is forever lost? Thanks to a moribund few, refusing to accept the evidence or even be guided by the precautionary principle! We here in Oz could benefit and enormously, if but guided by sane hands on the wheel and able to see and take the myriad advantages of a decarbed economy? Absolutely reliant on nuclear power, not just any nuclear power, but massively cheaper, walk away safe, molten salt, thorium power! Thorium power, providing safe affordable baseload power, whether the wind does or doesn’t blow or if the sun does or doesn’t shine or the rains fall or disappear! And energy so cheap as to make very broad scale desalinated irrigation viable and feasible. Land is we were told, the basis of all wealth, and patently wrong, when water is! And energy cheap enough to make creating hydrocarbons from seawater both viable and economic; along with all that flows from them, be it, jet fuel, diesel/petrol alternatives/cost effective and safe endless hydrogen production? And an enduring economic boost more like a tsunami of wealth creation and opportunities, unprecedented in history, for the pioneer economies. I mean, just harnessing this technology to nuclear waste disposal could earn us billions, while supplying virtually costless industrial energy, and churn out miracle cure, nuclear medicine. Unfortunately some very powerful players, I believe, mostly debt laden, tax avoiding, profit repatriating, price gouging foreigners are myopically focused on their sovereign risk, even where that conflicts front and centre, with the national interest or normal human empathy? Let me conclude with the following observation. A sun in a waning phase (solar dimmer switch) as our has been since the mid seventies, (NASA) may result in an ice age of indeterminate length? But never ever rising record breaking temperarures and granny/baby killing, rail buckling, heat waves! We could benefit. but not with, I believe the current myopically focused management/mindset, nor their preferred risk free template! When you’re heading in the completely wrong direction only one, about face, solution beckons!? 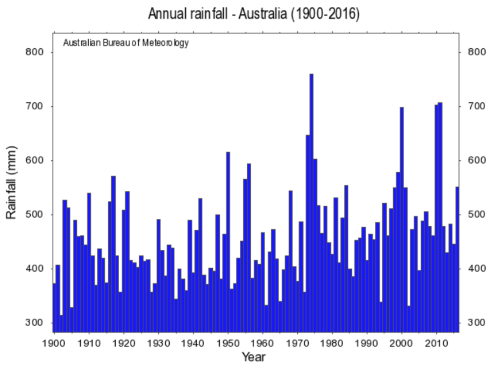 It is well known amongst country Queenslanders who have kept rainfall records for several generations that the first half of the last century was dryer than the second half. I was born in 1940 and my early memories are of drought in 1945, followed by the floods of the early 50’s. Unless people of today check those rainfall records they have no memory of weather changes over longer periods. By 2050 there will be very few people who remember the 1900s. Australian weather has always been changeable and people have short memories. A typical comment from you Alan. You like to get in first with a long diatribe to colour the conversation on the thread. And you make a fair bit of it up and generally ignore what is in the article. 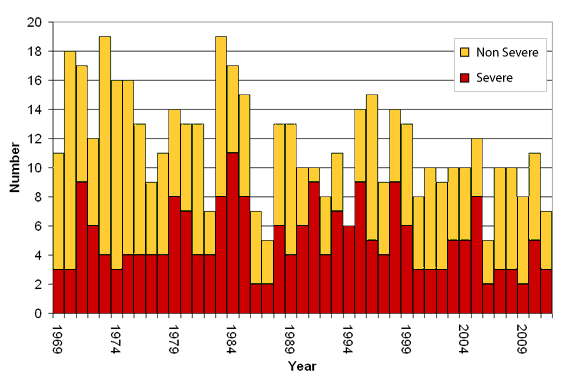 So you say that wind speed has increased, but not only is there no evidence of this, examples of extreme weather, as seen in the cyclone record, have decreased in the last 100 years as the globe has warmed. The graph showing that is in the article. An increase in average wind speed, only need be noticeable as a few kilometres (10-20] per hour as the mean average, is indicative of increased global convection. Cyclones rely on warm water as the creative source and power? And as such, don’t indicate more than, increased mixing can also produce columns of rising cold water? So your (paste and copy) charts prove very little either way? And NASA supplied the information about a sun in waning (cooling) phase since the mid seventies. And therefore should have resulted in a mini ice age or significant global cooling and advancing polar ice. Not the complete absence of Alaskan summer sea ice and a melting permafrost, releasing millions of tons of previously frozen methane. Nor can a cooler sun produce summer record heat waves! So your charts tell us little of value, just support an obvious confirmation bias? In any event, I stand by my take on nuclear energy as our best possible future and ask only that you Get on U tube, and check out Super Fuel, subtitled, green energy. where the Author, a well respected prize winning Journalist, will summarize for you, with a short 10 minute talk that rebuts some of the usual objections to thorium. But only if you want to do some fact checking. And given you unfairly accuse me of making stuff up, you owe me at least that much? I’d have thought you at least would listen to a highly credentialled investigative Journalist!? And carefully marshaled facts supported by peer reviewed scientific paper is hardly a diatribe! One of the few things left for the disabled to enable them to keep their self esteem is their integrity! And being disabled, five spinal fractures, with some spinal cord damage not assisted by a severe hemorrhagic stroke. My integrity is not just important, but all I have left that I truly value! [And I’ve kept some x rays, if you think I’m liar.] Moreover, there is a public record of hospital admissions and for what reason, if you think I’m into making stuff up. You can only say that because you can’t be bothered, with fact checking, least it proves you’re so far off the mark to be in orbit? That said, you are free to interpret my motives any way you chose? But that won’t change the facts. I have (some remaining) time on my hands and I’m genuinely concerned for our best possible future and what we leave for those who follow. I didn’t try to be first, given my first comment on this thread, was some time after 10am! And possible to be a first responder at that hour, if others have lost all interest in your take on climate change? And why would they bother? At least I almost alone did and as a courtesy. Given you more than anyone writing on the topic of climate change, seem to own your own facts? Robbie Burns said it best as, facts are cheils tha’ dinna whinge. You’ll have a nice day now,y’hear. Correction and apologies, four farmers a day, should be read as four farmers a week. Even so four farmers a week too many. My last paid employment was with a power Authority, where I spent some time in their coal lab, testing coal for calorific value and ash content. And at times collecting and testing environmental samples. I enjoyed my work, got on well with and liked my colleagues. A dream job for someone since early childhood was unusually inquisitive and wanted to know how things worked or what made stuff tick. I’d never heard of climate change and believed our future was as a coal fired economy and voted for the Nats. But that was over thirty years ago. And enforced retirement meant, I had time on my hands and remain just as inquisitive and enquiring as the boy I once was. I got my first computer in my late sixties, a gift from computer literate kids who wanted to stay in touch. It and the world it opened up was a Godsend. Thus when I first heard of climate change, I knew that this green initiated BS, given that’s what I believed it was back then, forced me back into research. And the hours became weeks the weeks became months, with much midnight oil spent. Then years and hours spent taking in publicly available lectures, some so dry and boring in presentation style, as to replace sleeping pills and or sedation. This stuff is not easy! So, Eventually as one must when confronted by marshaled, collected facts, I accepted climate change as real! But like many, simply assumed it was part of the normal range of cyclical weather, that change. However, when warming trends continued even as our sun went into a waning phase and according to NASA, who measure such things with satellite mounted highly accurate instruments, since the mid seventies! Now as much as it hurt my previous disposition, I accepted the unavoidable incontrovertible reality. That global warming as a completely cyclical, natural event cannot simultaneously occur during a waning phase period. When the only natural cyclical out that is possible is a cooling period, or even an ice age, and as always, accompanied by a cooling trend and advancing ice, not the opposite. Even so, what can we do, this is obviously irreversible, I thought and like so many others, decided to drink and make merry because tomorrow we die? But being a natural born optimist, decided I would not go into the dark without a whimper but use my remaining time and lucidity, while it lasted, to see if, we who seem to have at least in part do something to undo the harm, we seem to be responsible for? Alway providing the cure wasn’t worse than the ailment. Thus I found thorium and gradually came to understand not only was this significantly cheaper than coal and indeed, every green supported renewable, but a vastly better prospect of not just reversing climate change! But possibly generating enormous wealth and growth prospects into the bargain, particularly if it was used in part to power brand new, deionization based desalination, that puts endless cost effective water in the hands of any drought stricken farmer, who could want it! And indeed, given this new power generation source could be mass produced in factories and trucked to wherever we wanted, as ready to use modules! Able to bring new industries and opportunities to the bush, due at least in part to some diabolically dumb political decisions by folk not able to think much more than 3 years ahead? Thorium is without question, significantly cheaper than coal, and given it is also carbon free power, able to put most green renewables out of business or render them uneconomic. So I’m forced to fight on many fronts, against the anti development greens, and that seems to be around half of them? Screaming invective as they see their anti-development agenda dissembled before their very eyes by the irrefutable facts about thorium as as walk away safe, clean, cheap nuclear energy! And believe it or not, able to be deployed to mitigate against man made climate change! And while so employed produce a homemade range of useful replacement hydrocarbons/fuels/plastics/fertilizer etc/etc. I’m confronted by the, I believe, disingenuous fossil fuel industry, mendacious big nuclear and the oil owned or controlled fossil fueled auto industry. None of who and their disciples, want any part of thorium or what it promises! I hope Bob Katter follows through with his proposed royal commision into this nation’s energy industry and the apparent corruption of it? Anyone can challenge my take on climate change or that our future can only be a nuclear one? Given all that makes renewables viable is industry and farm crippling energy prices! And we if we’re intelligently led or informed/economically literate, will just not go there. Anyhow take a butchers at a book titled, Super Fuel, subtitled green energy, or at the Author and a short summation on U tube. Or, if technically minded, enter the case for thorium, into your search engine, scroll down the page to a downloadable PDF. Then get acquainted with the facts and a color coded schematic of a 230 MW thorium reactor. But only if you believe I make stuff up! I’ve spent years researching this subject! Surely even the most rabid opponent/coal devotee, could mange a couple of hours, but only if our future and the mighty irrefutable truth and it’s exposure genuinely matters? Correction and explanation. The bush shoulds be read as the dying bush. What this hopeful prognostication misses is that evaporation also increases with temperature, so it’s possible for drought to increase even if rainfall does. Moreover, under climate change more rain is expected as intense events rather than gentler, more extended ones, which is not as effective for retention of soil moisture. Graham, your piece is built around a sauce for goose/gander proposition, which I generally accept.But isn’t the real target the developing countries, which might be asked now to contribute to the rich countries that helped to green their arid lands? The whole thing is preposterous, and always was, and I don’t disagree with your jab at the renewables. Alan B should be allowed one long rant a week. In the first para he writes ‘I don’t see any benefit in increased rainfall that includes 1 in 100 year flood events or wilder weather’. Perhaps he is too young to remember the 1956 flood period, the biggest in the Murray/Darling’s history. And he didn’t look at the graph showing the wilder weather is declining. Then I thought, why do I bother. He’ll just write another rant. And he did! And then a third, at the end of which he worries ‘I’ve spent years researching this subject’! I can’t see any sign of the research. All I can see is a powerful commitment to a point of view that ignores any evidence to the contrary. Well, A powerful rant eh Don? Is that the best you can do? With no attempt whatsoever to challenge the substantive facts! Most important of which is, you cannot get in normal cyclical weather, record heat waves and ice melts, during a solar waning period! Just the very opposite, along with advancing polar/glacial ice! Obviously you didn’t bother to read, Super fuel, subtitled green energy, nor did you bother to download, the case for thorium as a free PDF? Too technical for the Professor? Feel free to challenge the (ranting) Author of, Super Fuel, or the highly credentialed respected scientists who made their, case for thorium, (rant) PDF available for genuine researchers! Or hundreds of ranting NASA/climate scientists, who obviously must be involved in the largest ever conspiracy, with their claim of a sun in waning phase since the mid seventies!? Just not coal advocates with set in concrete, entrenched self serving views? Are you still receiving research grants/consultancy fees, fee for comment, from a fossil fuel company? And given that has long been the reported case? Probably explains your patently puerile, personal, powerful, play the man not the ball attack! As multimillionaire businessman, Mr Holmes A’court said on breakfast radio, there’s no appetite among investors to invest in coal! Obviously the smart money is looking elsewhere? Just not recalcitrant troglytes, with a “powerful” alphabet soup after their name, strenuously overreaching, guarding a patch? And reminiscent of a reporter of mythical legend, not allowing the facts to get in the way of good story? With all “due respect”, Alan B. Goulding. During the post war 1950’s, we went from a backwater economy producing three thousand five hundred megawatts of electricity, to one of the first world industrialized economies, producing thirty five thousand megawatts! As cheap affordable power, which alone was the only cause of the expansion. With the cheapest most affordable example being in Victoria, with its state owned and operated power generators coupled to state owned and operated open cut coal mines in the immense Latrobe valley. This then is the natural cost of energy! What it costs to get out of the ground coupled to what it costs to burn it to generate electricity! Those mines produced a couple of profitable offshoots such as Melbourne’s cooked coal gas supply and coal briquettes. No Victorian could not reasonably afford winter heating or year round cooking. Even where one had to feed a meter with a few florins. Other states had little other choice than follow this demonstrably sane example, with most power generation and distribution performed by state owned entities and local government. This era of industrial growth and full employment saw some private players sit up and take notice. What could be better than a captive energy market and profits that had a permanent upward curve? So, the last few decades have seen energy prices more than trebled and helped by a massaged fuel market that saw petrol and diesel prices go through the proverbial roof. Much to the glee of the oil company oligarchs. Assisted by a patent plethora of politicians and professors suddenly succumbing to a severe case of highly contagious, Sargent Shultz syndrome? With some of the more recent examples including Labor stalwart Mark Butler knowing we couldn’t have nuclear power because it wasn’t Labor party policy. And no matter how the question was put or rephrased, remained his only, broken record rhetorical response. Or similarly, energy and environment minister, Josh Frydenberg, who said and I quote, energy policy is the result of the regulation framework. And sheer genius! Even as he seems to have missed the fact that, that regulatory framework is the product of political decision makers and no other. Just as it was when the state of Victoria was able to rollout stated owned and operated, truly affordable electricity! Nowhere can one find a single example of privatization, producing lower costing more reliable power supply. Today’s recalcitrant politicians even though dyed in the wool private practise idealogues/conservatives, when confronted by the reality of the smart money exiting coal, suddenly found their inner socialist and a case for government expenditure in coal fired power. Moreover, given their (self made) regulatory framework forbids it, unable to even contemplate the advent of peaceful purpose nuclear power, as the only realistic substitute for affordable base load energy that could repeat our post war industrial expansion! expansion!? Industrial expansion that saw us go from a war ravaged, economic basket case to the third wealthiest nation on the planet and a creditor one at that! And one where a single income could buy an affordable family home, a serviceable motor car, feed, clothe and educate a family and supply an annual holiday! One of the reasons this was possible was because our discretionary income wasn’t all but consumed keeping the lights on? So that debt laden, tax avoiding, profit repatriating, foreign speculators can still make a handsome return after debt and dividend servicing? Dividend servicing being the most important to vociferous fossil fuel advocates, regardless of climate/national interest outcomes? Could we reinvent our economy to recreate that 150’s heady era of economic growth that meant one could earn a weeks wages, by just introducing a new employee to a local manufacturing company? Yes we can but just not with the current template/regulatory framework, which insanely forbids even peaceful nuclear power, even where the demonstrable facts prove beyond question that thorium based power simply can’t be used for any other purpose! Whereas, if rolled out as government facilitated and funded, free market, private enterprise, employee owned and operated cooperative enterprises, could produce the lowest possible energy prices anywhere. But, even more so if not linked to a great white elephant of an energy consuming, ultra costly and very vulnerable national grid! 3 cents PKH and less, is eminently doable! So just get on with it, prevaricating politicians and professors,. Don’t stand in the corridors or in the way! Just fix or amend the government imposed regulatory framework and allow genuine fierce free market competition to bring sanity and economic growth back to this poor beggar country! And if carbon free power also addresses man made climate change, who in their right mind, is going to argue against that? Money grubbing, power hungry, contemptible quisling ideologies perhaps? I hadn’t wanted to be the sole voice arguing for energy policy sanity!? But it seems that others have given up or can’t be bothered. Given our current crop of patently self serving or conflicted politicians seem to avoid by any means possible doing Any more than forced to? Even where the national interest and our best possible economic outlook, all but demands action? The smart money is not waiting for recalcitrant idealogues to act but are doing what they’re allowed to? By the laws and regulations, created in this nation’s parliaments! Moreover, that is where all the political grandstanding that replaces positive action takes place! Other nations have seen the writing on the wall with record numbers of young voters, voting for change! Given, they almost alone have a vested interest in genuine reform, while the older recalcitrant, vested interest views, seeing only the status quo and or protecting a patch!? These latter views maintained in spite of the fact, in a decarbonized world, possibly replete with increasingly punitive carbon tariffs, pioneering carbon free economies stand to prosper the most! Our response? A war of weasel words that essentially replaces action! Action, which in a war/emergency setting, would suddenly become both affordable and doable! We however have vastly more important fish to fry? Such as post politics positions and pensions etc? While the economy goes to hell in a handbasket. And drought ravaged African communities starve in a climate change crisis far greater than anything produced by the second world war! Little wonder I’m lonely as almost the sole commentator in the comments column. Want to verify facts from an independant source? Get on U Tube and a google tech talks, titled, thorium in four minutes! And then maybe another titled, Super fuel, subtitled green energy. Where the Author encapsulates his highly informative book with a ten minute talk that includes some rebuttals of false facts about thorium. I leave it with you, I’m done. Be informed by the facts not fossil fuel fiction! Too many folk are looking at this through the spectrum of environmental outcomes only? Even as major trading partner, the USA, once again breaches the amended upward revised and frightening debt ceiling! And while other principal trading partner, China, also builds a massive and unprecedented, unsustainable debt level more than twice their total GNP!? We for our part are racking up unprecedented record debt on all fronts, with foreign and domestic breaking former record levels! And government debt and the deficit continues to rise alarmingly, while politicians of all persuasion thunder at the dispatch box, trying to hammer home who is responsible for our parlous position? Almost as if sheeting home the blame while getting a modest political advantage was all that mattered? And so immersed in this theatre of the ridiculous! They have become seriously compromised, when trying to actually solve the energy crisis. Which needs to be effectively dealt with before it dominates the next election! We seem to be able to fund a coal fired power station, but unable to find the same money for a similarly priced solar thermal power plant with base load applications. Perhaps it is significant that this nation most outstanding record as pertaining to the lowest costing energy provision, Victoria’s Latrobe valley, with it huge continuous open cut mine and the recently mothballed power plant. Or the true visionary engineering feat of the age, the Snowy Mountains scheme. Were rolled out by labor governments using taxpayer’s funds to service loans etc? We can find funds for pumped water storage and inland rail? But none for carbon free energy, given both sides of the isle, seem to think, the status quo and endless blame shifting holds some political advantage? When the reality is anything but, with N.B., a France like result in prospect, as the only achievable outcome!? The only thing our political class seem to excel at is undermining/backstabbing for some perceived short term political advantage and monumental timidity! Insanity is doing what you’ve always down while expecting a different outcome!? And in the case of France, that outcome was very different and totally unexpected. Ditto the diabolically divided UK/USA! With the latter having one reported republican controlled state putting President Trump’s low tax/reduced spending plan into operation, only to prove it not only didn’t work but sent the state in question reeling backward! As the (proof of the pudding) economy, all but shut itself down! Lower taxes are doable, but not when the economy is contracting as the sole result of downright dumb decisions! If you want lower taxes, you need to stimulate and grow the economy as an essential precursor! And we’ve got just one shot in the economic locker to get that done! And that one shot is cheap affordable deprivatized energy! Namely cheaper than coal thorium energy. In walk away safe, mass produced, molten salt, thorium reactors. Thorium is the most energy dense material on the planet an abundant enough to put some energy suppliers out of business! And were that to happen, return some semblance of sanity to this nation energy provision, and or security! Transitioning to a (recommended) form of carbon free energy, all that holds the only real prospect or enduring economic expansion! Without which, we are just economic flotsam and jetsam; whirled in an upcoming economic maelstrom with no credible means or action plan to prevent ourselves slipping into an enduring recession replete with deflation/stagnation! And don’t say you weren’t warned! The time for safe, small target timidity, is over!